They died in their sleep one by one, thousands of miles from home. Their median age was 33. All but one — 116 of the 117 — were healthy men. Immigrants from southeast Asia, you could count the time most had spent on American soil in just months. At the peak of the deaths in the early 1980s, the death rate from this mysterious problem among the Hmong ethnic group was equivalent to the top five natural causes of death for other American men in their age group. Something was killing Hmong men in their sleep, and no one could figure out what it was. There was no obvious cause of death. None of them had been sick, physically. The men weren’t clustered all that tightly, geographically speaking. They were united by dislocation from Laos and a shared culture, but little else. Even House would have been stumped. Doctors gave the problem a name, the kind that reeks of defeat, a dragon label on the edge of the known medical world: Sudden Unexpected Nocturnal Death Syndrome. SUNDS. It didn’t do much in terms of diagnosis or treatment, but it was easier to track the periodic conferences dedicated to understanding the problem. For the rest click here to go to The Atlantic. 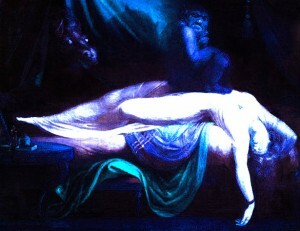 More on the phenomenon of sleep paralysis, here.